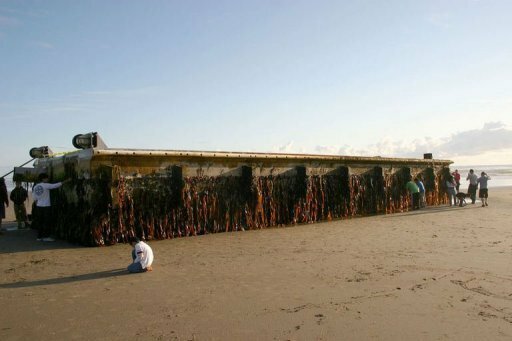 A 125 m2 concrete pontoon washed ashore on Agate beach, Oregon, 100 miles (160 km) southwest of Portland. This floating concrete dock is believed to be the largest and heavies debris ever found in the farthest distance ever recorded. The floating concrete dock, made on 2008 and detached from its service site, the port of Misawa, in Aomori Prefecture in the northern part of Japan, on March 11/2011, is obviously in a working and stable condition. A team of experts are now examining the gigantic floating structure to come-up with a solution for the run away dock. The current potential solution will be either salvage of the structure and installing it in a nearby deck or demolition and recycling the product. The reinforced concrete pontoon weighing some 165 ton has a area of 125 m2 (21.6m x 5.8m) and a height of 2.13m. 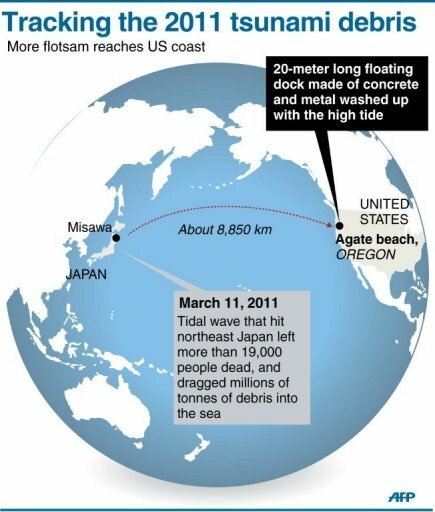 The pontoon made of reiforced concrete with styrofoam blocks inside it has crossed Pacific ocean, from Japan to land on US soil, 8850 km away.